From the diagram, we can see whole system can be roughly divided into two parts. 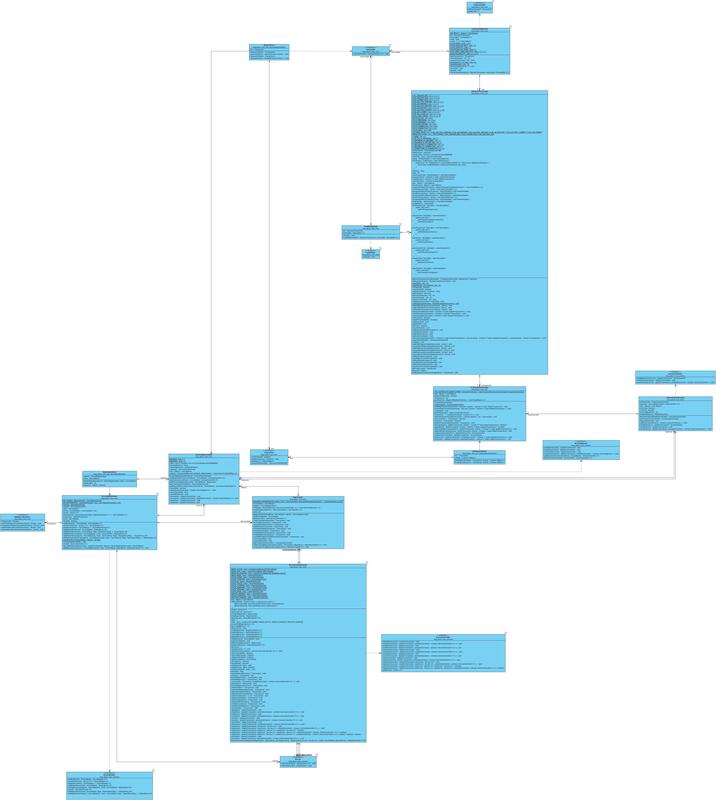 The bottom left corner is the container layer, and the up right corner is the transaction layer. The connection point is ServiceContainerImpl <-> TransactionController. The above diagram shows that the ReadTransaction interface extends the Transaction interface, and UpdateTransaction extends from the ReadTransaction. When we want to use the transaction controller to create the service container, or adding services into the container, or removing services from the container, then we need the UpdateTransaction as a handle to request the controller to take these actions. We will see the detail usage of the update transaction later. * Created by weli on 16/05/2017. The above line will create a new instance of the TransactionController. Nearly all the actions in the container are asynchronous. The above code creates a transaction. You can think a transaction as a handler provided by TransactionController to control the whole lifecycle of the service container. The transaction will be used to create service container, register services into container, and it is associated with an executor. We will see the usage of the UpdateTransaction later. 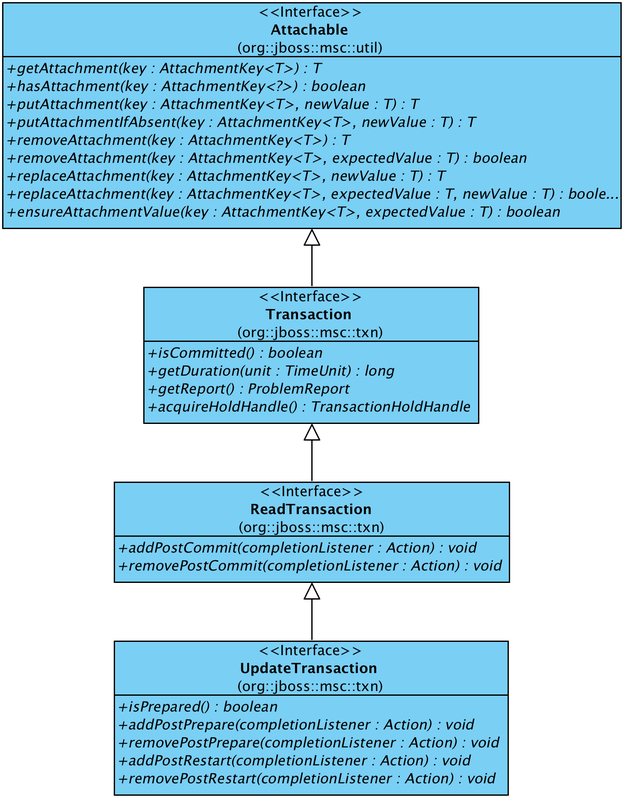 The above transaction creation action is executed asynchronously, so we need to create a CompletionListener in above code to wait for the transaction creation to be done by the controller, and finally we get the UpdateTransaction from the listener. We get the service container from the service controller as shown above. Please see the usage of transaction. The update transaction is associated with every action issued by the controller, and the transaction will be prepared and committed at last to modify the service container statuses. We will see this in following code. The service registry is created from the container, and it will be used to include services. The above code defines a FooService that implements the Service interface. It’s a service just does nothing but just output some log. The above code used the service builder to connect the service to its service name. We can see the prepare(...) and commit(...) actions are all related with the update transaction, and these actions are all executed asynchronously. We can see the container relies on the transaction handle to manage its consistency of the internal state. All the actions are associated with the update transaction, and after the update transaction is committed, the actions will alter the container state. In addition, there is only one update transaction can be in action at one time. It does not allow multiple threads to get many update transactions to alter container internal services and their statuses at one time. If there are many threads requesting the update transactions, only one thread will succeed and others need to wait. 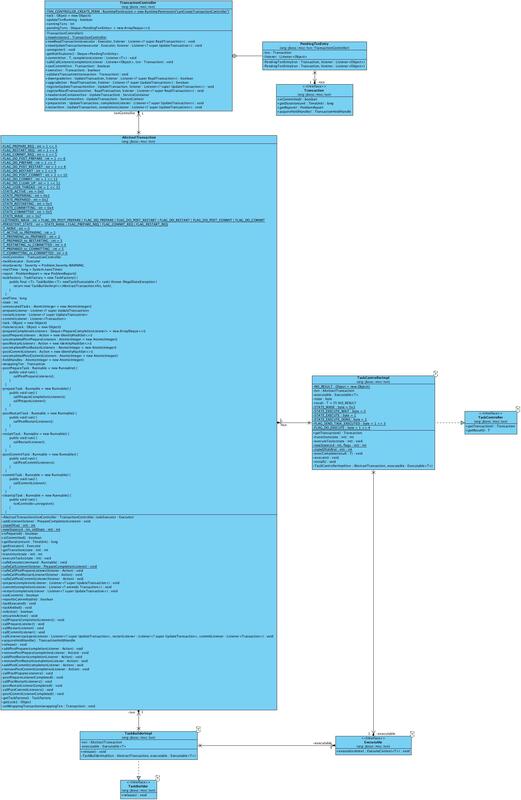 From the above diagram, we can see if there are more than one update transaction creation requests, the requested update transactions will be put into pendingTxns queue, and there is only one running update transaction allowed and the listener will be called to return the transaction to the caller. The other callers will be blocked if they call their completion listeners.